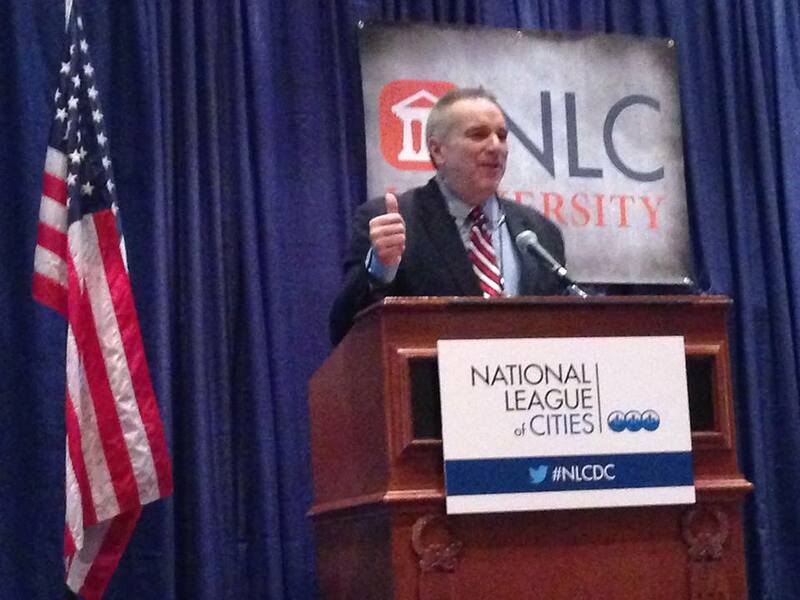 National League of Cities Service Line Warranty Program Advisor Jim Hunt, of Amazing Cities, was the Master of Ceremonies at the NLC University Awards Luncheon. The NLC University is dedicated to local leaders improving their skills. Our team had a great time in Washington, D.C., at the National League of Cities (NLC) Congressional City Conference last week. We were very excited to meet with new potential city partners and hear President Barack Obama speak about exciting new initiatives. Through the NLC Service Line Warranty Program, we are proud to provide a great resource for communities in North America that help address an aging infrastructure problem. Through city-specific terms and conditions, homeowners are protected against the unexpected and expensive repairs when the water and sewer lines on their property fail. For homeowners, affordable coverage for broken or leaking water and sewer lines and now in-home plumbing helps ensure that a service line emergency won’t be catastrophic. We are committed to helping city leaders provide affordable solutions that save residents money and time and safeguard the environment. Together, we wake up every day ready to solve problems for the thousands of homeowners that we serve.